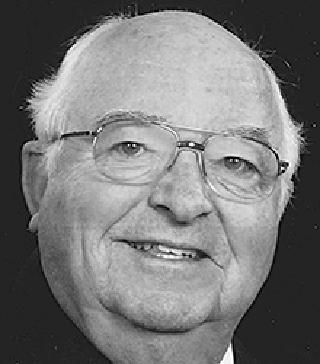 Gardner age 85, of Maumee, Ohio passed away on Friday, February 12, 2016, at Hospice of Northwest Ohio, Toledo after recently suffering a stroke. She was born in Perrysburg, OH on August 28, 1930, to Joseph and Henrietta (Brickner) Pfleghaar. Dee was a secretary at Owens Illinois and was a member of St. Joseph’s Church and the Rosary and Altar Society. She was an avid Detroit Tigers fan. Surviving is her loving husband, Robert Gardner; daughters, Karen Gardner (Dennis Visocsky), Susan Warner (Todd) and Mary Flynn (Tim); grandchildren, Jake, Maggie, Alex, Billy, Emily, Kayleigh, Maddie, Ben and Abby; brothers, Jim, Bob, Ron (Kathy), Jerry (Bev), David (Jan) and Dan Pfleghaar; sisters, Ellen Dinkens, Sharon (Eddy) Cleghorn, Carol (Adrian) Carvalho and Diane Jenkins. In addition to her parents, Dee was preceded in death by her son, Jeff Gardner and brothers, Gordy, and Eugene Pfleghaar. Mr. John J. Longmore, loving husband for 65 years to Nancy L. (nee Lippert) left this life on Sunday, January 31, 2016, at the age of 85. John is survived by his children, Cynthia (Thad) Beeley, Sandra (Edward) Nowakowski, Melissa (Patrick) Gwynne, Michele (William) Curtin, Lynne (David Dillard) Sherman, and John (Belinda) Longmore; and sisters, Geraldine Johnson and Mary Miller. He was the proud and loving grandpa to Jamie, Jodie, Lucas, Mark, Steven, and Christy; Aaron, Megan, Danielle, and Emily; Jonathan and Thomas; Angela, Corrina, and Michael; Chad and Nathan; Chelsea, Morgan, and Drew; and great-grandpa to Cameron, Mitchell, Claribel, Madeline, Eleanor, Leo, Vera, Mary, Anthony, Isabel, Joseph, Elizabeth, Liam, Isla, Lilian, Evelyn, Maira, Will, Violet, Wyatt, Patrick, Chloe, Jacob, Trevor, Cassidy, Kiera, Maxton, Jonah, Kylie, Kaylin, Kamryn, Colton, Hannah, Noah, Grace, and one to be born in the spring. He was preceded in death by his parents, Andrew D. and Sivilla Longmore, and siblings, James and Nora. John graduated from Central Catholic High School, and attended UT. He worked selling metals for Williams and Company in Toledo; he also worked for Art Iron, and Ciralsky and Associates; he founded Aluminum Cookware, Inc. and is the past founder and owner of Builder’s Steel. John was very active in the community, coaching youth football and basketball, and was a volunteer at Catholic Big Brothers of Toledo. He was very active at OLPH parish, having served as founder and President of OLPH Parish Council; he also served as lector and Extraordinary Minister of Holy Communion; he was a founding leader of OLPH prayer group, and sang with the Servants in Song, a ministry of the MCCR. Aside from his wife and family, the great love in his life was Huff-A-Long Lodge, a wonderful cabin on St. Joseph Island that he was part owner of for 40+ years. His greatest thrill was teaching his children and grandchildren to fish—helping them land their first golden perch, or trolling them into their first Northern pike. Campfires were times for song, stories, star-gazing, and fellowship. His passion sparked our love of the North, and his grandchildren and great-grandchildren after us. The singer, the whistler, the jokester, the friend to all, the best fryer of delicate perch filets, one who would drop everything to offer help and a prayer to one in need—that was our wonderful husband/father/grandfather. May you rest in peace! Friends may visit at the Coyle Funeral Home, 1770 S. Reynolds Rd. on Wednesday, February 3, 2016, from 2:00-8:00 p.m., where a Scripture Service will be held at 7:00 p.m. Funeral services will begin in the funeral home on Thursday at 9:30 a.m., followed by the funeral mass at 10:00 a.m. at Our Lady of Perpetual Church. Memorials may take the form of a donation to Our Lady of Perpetual Help Church.